Moreporks are made from the finest Laura Ashley fabric book pages and filled with clean dry sand. They seek employment in fun-loving homes. They are compatible with other pets and require no special treatments, remuneration or food.Quiet in nature they make no sounds audible by humans, making them ideal house pets.They also make great bookends, are fantastic housewarming gifts. 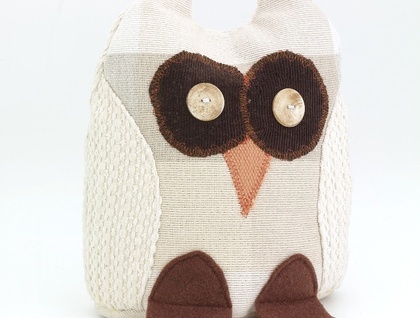 Wise One is made from natural cotton/linen Upholstry grade fabric with a retro textured effect. Her front is mad from mitford check fabric with shades of off white through to pale taupe. She has dark chocolate eyes with a orange beak and chocolate feet, Whooo loves Wise One? Weight approx 2.8kg Please note due to weight, items sent overseas will be sent emptied of sand.